The Acclaim Bathroom Storage Wall Cabinet is a great way to add stylish and functional storage space to your bathroom oasis. This ergonomic and elegant wall cabinet is designed to be placed over the toilet or used as extra wall storage just where you need it most. Brushed chrome hardware accents complete the look and complement the entire Acclaim line. Acclaim 25-inch W x 30-inch H x 9-1/8-inch D Bathroom Storage Wall Cabinet in Espresso The Acclaim Bathroom Storage Wall Cabinet is a great way to add stylish and functional storage space to your bathroom oasis. This ergonomic and elegant wall cabinet is designed to be placed over the toilet or used as extra wall storage just where you need it most. Brushed chrome hardware accents complete the look and complement the entire Acclaim line. 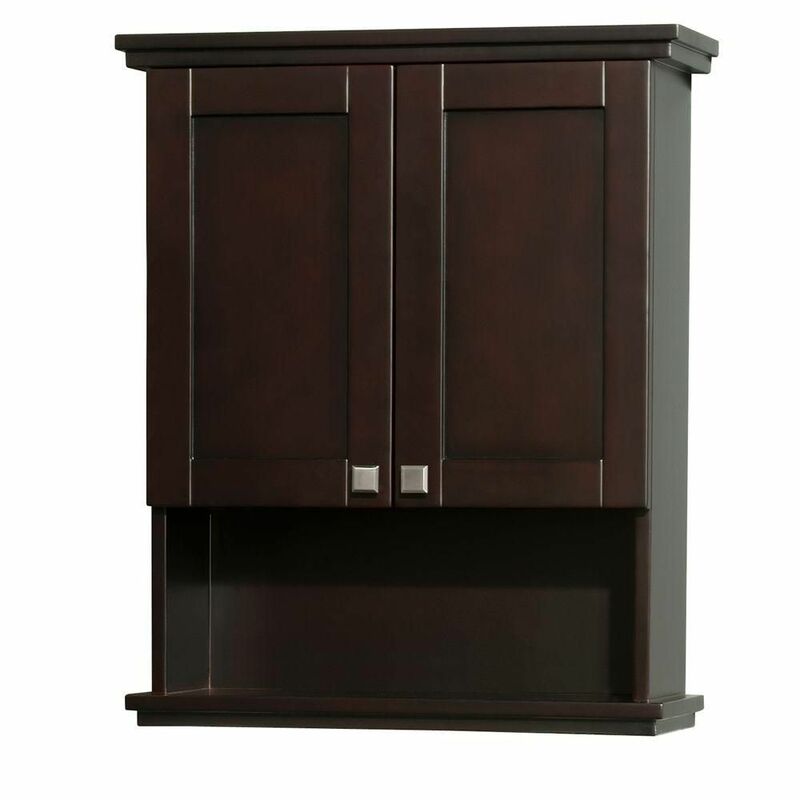 Acclaim 25-inch W x 30-inch H x 9-1/8-inch D Bathroom Storage Wall Cabinet in Espresso is rated 4.3 out of 5 by 15. Rated 5 out of 5 by HomeDepotCustomer from The cabinet was exactly what we wanted.... The cabinet was exactly what we wanted. Rated 5 out of 5 by mArkitect from Solid construction. Well Built. ... Solid construction. Well Built. Rated 5 out of 5 by Kathy from Very well-made toilet topper cabinet! We are pleased with our purchase. It was easy to install an... Very well-made toilet topper cabinet! We are pleased with our purchase. It was easy to install and holds a lot of the necessities you need in a bathroom. We love that the hinges are soft close, too. I would highly recommend this cabinet to anyone looking to add a storage cabinet to your bathroom. Rated 5 out of 5 by Ron from Prefect fit, and perfect match with existing bathroom cabinet.... Prefect fit, and perfect match with existing bathroom cabinet. Easy to install. Rated 5 out of 5 by MAK from Really like the simple lines of the shaker style. The... Really like the simple lines of the shaker style. The trim on top and bottom of the cabinet add interest. It has a mounting board which means you can easily lift the cabinet off for painting and then simply replace it. It was however darker than I expected from the pictures. Rated 1 out of 5 by Cindy from The dimensions inside the cabinet is barely 7" deep so the product description is deceitful. We e... The dimensions inside the cabinet is barely 7" deep so the product description is deceitful. We expected this cabinet to be 9 1/8" as described. It is way over priced for the actual storage space it contains. Rated 5 out of 5 by Linda from Love my cabinet. Looks rich and matches my vanity. Enough... Love my cabinet. Looks rich and matches my vanity. Enough storage space and has a soft close to the doors.